Why not have a simple flat tax or a national sales tax? Yes, it is called opportunity cost. Why does our tax code need to be so complex? Any discussion of compliance cost is incomplete without recognition that we are discussing only the Federal portion of tax compliance. States have no obligation to coordinate with the Federal tax changes and may muck up the works by continuing with current tax policy. In fact, they may even go in the other direction. Because the Flat Tax is not progressive and the FairTax has no individual taxes, a progressive State may decide to heavily “tax the rich” on incomes. Nedlandp and Chip Spradely, high tax rates don’t really bother me. The problem is with some of the wasteful spending. Most of the compliance savings under either FairTax or Flat Tax will benefit individuals, not businesses. The business portion of the compliance savings will be well short of the 15% you mentioned. Chip Spradely, I also support the Fair Tax. However, flat tax advocates have their share of good ideas. That last comment was in reaction to yours. The compliance cost savings would be the same for a true Flat Tax, collected on ever dollar earned, since you could eliminate reporting by employees and all tax reporting would devolve to businesses, broadly defined. 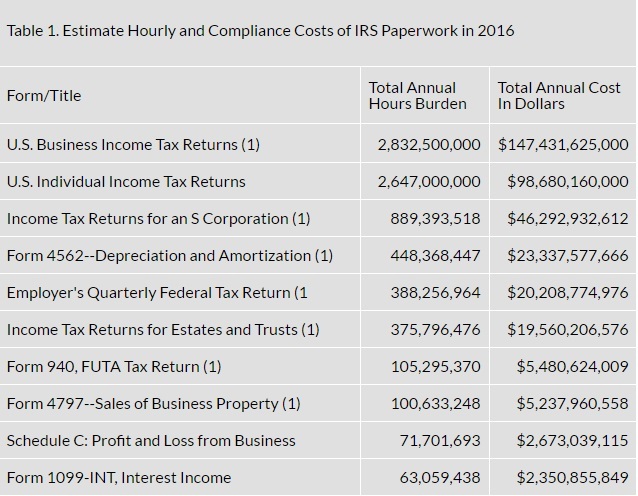 Any compliance savings from the FairTax will be overwhelmed the cost increases when employees begin receiving gross pay rather than net, because the total tax burden must be added on a much higher cost base. Currently the majority of taxes are embedded in gross salaries. When you eliminate those taxes in effect you give everyone a raise. You cannot give everyone a raise then collect the same dollar tax revenue and expect that prices will not have to rise substantially. The cost to business for complying with the tax code(about $400 Billion per year) plus the taxes a business pays is passed right to the customer. The Fairtax eliminates this huge cost added to the product/service. The complying cost alone would reduce the price of products/services by a realistic 15%. The Fairtax is the answer. We just need to educate people. Nedlandp, you are not technically required to respond to me specifically, however, when I told you to give me hard facts to prove me wrong about some other post or to not waste my time, that was harsh on my part. So I will apologize for that. My initial irritation was because we did not seem to be communicating our differing views in ways we could both understand. Good thoughts, but to clarify: Taxes are collected on salaries, profits, and sales, but as you mentioned taxes are paid by the consumer in the final price paid for the product or service. If you eliminate corporate taxes, you must raise tax rates on salaries or sales, to maintain the same tax revenues. Top managers will reduce salaries in order to increase untaxed profits in which they share, requiring a further bump in taxes on salaries and/or sales. To eliminate such games, salaries and corporate profits must be taxed at the same rate. Also, if you eliminate taxes on corporate profits, you must retain taxes on dividends and capital gains, which is much more inefficient than taxing at the source. Double taxation of profits reduces investment. If you make the US the world’s best tax shelter for investors, corporations won’t mind taxes on profits, assuming that corporate taxes are collected on territorial sales only. Just to complete the thought, in theory the FairTax eliminates taxes on salaries and corporate profits and lays it all on sales. In practice, taxes on corporate profits can be exchanged for taxes on sales, however, if you eliminate taxes on salaries, the corporate FICA could be moved to sales, but income tax and individual FICA payments are embedded in gross incomes. When you eliminate the tax you do not eliminate the cost to the business, and because the tax must be collected on top of increased costs prices must go up. Zorba, I hope that the “value” of satisfying your envy is a joke. Taxes don’t make people happy, since no-one is happy with tax. Even those who don’t pay any tax aren’t happy, as they think others should be paying more so that they can have more spent on them. The few who pay the majority of tax feel they are being exploited, and just about everybody else think the rich are paying too little. Those in the middle worry about how much they will have to pay if they succeed or die. There are good economic and well as moral reasons for at least some tax to exist – externalities for example – but there is no need whatsoever for complex tax systems. Nor is there any need for corporate tax whatsoever – it is paid by staff and customers, not businesses (which are simply assets). The whole system needs to be rethought. While it is true that those receiving distributed tax money are happier, the money comes from investments and purchases not made in the free market. Some redistribution has merit. We certainly don’t want people destitute. However, excess distribution leads to disincentives and the slowing growth you have long decried. That means I get a 30% discount on costs government should be helping me to avoid. And as an added bonus I only lose 70% of the revenues I might have earned if I wasn’t wasting my time on taxes. It’s not free time if you are forced to do it. Doing my taxes is not on the top of my list along with tennis and golf, it doesn’t even come close to doing needle point. I wonder does that cost account for the physical and intellectual energy spent strictly on tax filing, or does it include all tax maneuvering energy. For example, for the small affected minority of greedy bastards, state tax planning is a lifetime endeavor, I imagine. There is though an alternative way to look at it. Taxes, their existence, and redistribution in itself makes many people happy — and thus taxation has prosperity value in and of itself. GDP may not increase but we get the intangible and standard of living improving effect of satisfying our envy. Henry: Charity energy that gets spent on filing taxes for seniors is charity energy that is wasted in redistribution. It is charity energy that does not go towards driving seniors to hospitals, reminding them of their pills, helping them with the leaky plumbing, housecleaning, cocking end all the other things nature demands from them which they are less able to do on their own. These are natural needs — and thus mostly inevitable. The tax compliance costs on the other hand are the artificial inefficiency costs that we force on them via redistribution. What I was complaining about in the TF report was the idea that personal income tax prep time was valued at $37/hour. That bit of nonsense is why the total cost numbers got so high and unrealistic. Do economists generally agree that free time has some sort of monetary value?? Your graph is in trillions while the text shows billions. Which is it? As I have written in the past, a true flat tax on all earned income would be the simplest. Employers could accurately withhold the correct amount and file for each employee. Businesses obviously file their own taxes, so the IRS would only be involved with businesses, broadly defined. However, a flat tax is a political loser, if the effective rates are not progressive. A standard deduction can make rates progressive, however businesses would no longer file accurate returns. Instead, a UBI allows for the separation of tax collection from the distribution of UBI funds. No matter how many jobs the individual takes, collection by the employer(s) will be accurate. People mistake the UBI for welfare. It could be that but it can also be a replacement for all tax deductions, and it provides the political carrot to get a flat tax passed. With all due respect, the costs of doing taxes for many of us far exceeds $37/hr. This year, I was forced to convert from a Sole Proprietor to an S Corp. Legal cost $375. I needed special accounting services to make sure the transfer was handled appropriately, $875. Along with cost of QuickBooks, which I can’t charge to taxes because I need it to run my business, I needed to buy my annual TurboTax for $90. Separate from the tax accountant will be a charge estimated at $2,300, for an accounting clerk, when all is said and done. I expect 3-4 days of my time will be required, which I normally bill at $60/hr. There may be many who don’t spend much time on taxes, but I’m certainly not one of them. I can no longer do my own taxes, even though I do a lot of blogging on tax policy and have an MBA from Wharton, for God’s sake. Dan, with all due respect, this Tax Foundation report is garbage. Does anyone really believe that the time we spend filling out tax forms on the weekend is worth $37/hour? And there is never a mention of the millions of free tax returns done by thousands of our senior citizens on behalf of an AARP sponsored program. In addition, computers do most of the “stubby pencil” work at great savings these days. Thanks for providing the data, but it should be taken with a grain of salt! Perhaps the whole salt mine?? ?